In this volume, Albert Hirschman reconstructs the intellectual climate of the seventeenth and eighteenth centuries to illuminate the intricate ideological transformation that occurred, wherein the pursuit of material interests--so long condemned as the deadly sin of avarice--was assigned the role of containing the unruly and destructive passions of man. Hirschman here offers a new interpretation for the rise of capitalism, one that emphasizes the continuities between old and new, in contrast to the assumption of a sharp break that is a common feature of both Marxian and Weberian thinking. Among the insights presented here is the ironical finding that capitalism was originally supposed to accomplish exactly what was soon denounced as its worst feature: the repression of the passions in favor of the "harmless," if one-dimensional, interests of commercial life. To portray this lengthy ideological change as an endogenous process, Hirschman draws on the writings of a large number of thinkers, including Montesquieu, Sir James Steuart, and Adam Smith. 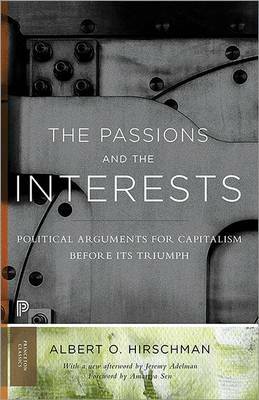 Featuring a new afterword by Jeremy Adelman and a foreword by Amartya Sen, this Princeton Classics edition of The Passions and the Interests sheds light on the intricate ideological transformation from which capitalism emerged triumphant, and reaffirms Hirschman's stature as one of our most influential and provocative thinkers.